Fantastic and very nearly flawless; everything you could hope for from a new Foo Fighters record. Wasting Light is the best Foo Fighters album in a good long while. One by One has its defenders, but this is probably the best thing they’ve done since The Colour and the Shape. Partly, this is because Wasting Light has more modest intentions and scope than some of its predecessors. After spending a couple of albums proving that they're more than just a rock band -- crafting double-album statements, releasing mature acoustic or piano-based stuff -- Foo Fighters seem to have rediscovered the joys of being, at heart, a good old-fashioned rock 'n' roll band. Hell, it was even recorded in Dave Grohl's garage. Admittedly, his garage is probably much nicer than yours or mine, but still. On first listen, Wasting Light can almost seem unremitting. Even before Dave Grohl revealed his tender acoustic side, Foo Fighters tended to have the occasional lighter moment like "Big Me" or "Tired of You". Here, the only subdued moments are verses, before the chorus comes around at full volume. The closest we come to a sustained, quieter mood is the penultimate track, and even then, it still works itself up to pretty ferocious climax. Closer attention, though, reveals a surprising amount of variety, even if the dynamic levels and tempos remain elevated throughout. Opener "Burning Bridges" benefits from a kinetic arrangement, starting with a syncopated riff, then adding perpetual motion chord changes and some unexpected stops as the song develops. "Rope" has some killer machine-gun riffs and truly exquisite guitar harmonies (not to mention a wild, squealing solo for good measure). "Dear Rosemary" is a more straightforward rock song, but a damn good one -- bringing in punk rock innovator Bob Mould to help on guitar duties and backing vocals is such a good idea I had to go back and check to make sure they hadn't done it before. "White Limo" is pure distorted aggression, all snaky guitars and howling. "Arlandria" has one of the most powerful choruses in Foo Fighters' career, which already boasts several. "Back & Forth" is straight guitar pop. "I Should Have Known" revels in some bluesy and jangly elements, soaked in strings, before Grohl's old bandmate Krist Novoselic comes in with a particularly crushing bass part to wrap things up. Superlative melodies abound, and for every chorus that repeats itself until it approaches to point of exhaustion, there's a riff of startling invention to reclaim your attention. In the end, only two songs don't quite measure up to the others. "Miss the Misery" sounds an awful lot like Bon Jovi (it may be that some prefer "Livin' on a Prayer" to "Everlong", though I can't imagine why), and "Walk" makes for an underwritten conclusion to the record, some riffs and optimistic bluster in search of a song. There are one or two other problems, chief among them Grohl's lyrical tendency to lapse into cliché. ("These are my famous last words!" goes the beginning of "Burning Bridges". The rest is better.) I mention them only out of a sense of professional obligation, though. 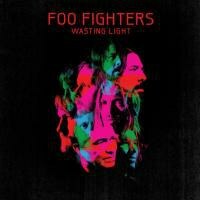 Wasting Light is so consistently good that its minor flaws are subsumed by the sense of goodwill and energy it generates. It'll sound great on the car radio; it's complex enough for the snobs and geeks, but it'll play to the cheap seats in an arena. Foo Fighters have simply released one of the best albums of the year, and of their career.